Fans of Ripper Street can rejoice. Amazon UK has released a new trailer for the series’ upcoming fourth season. New episodes of Ripper Street will begin airing on the streaming service on January 15th. This will be the second season that Amazon UK has streamed after the service picked up the series when the BBC cancelled it after two seasons. For season three, episodes began on Amazon and aired later on BBC America in the United States. It’s unclear whether it’ll be the same for season four. Earlier this year, it was announced Amazon had renewed the crime drama for a fifth season in addition to the upcoming fourth. The new season will see the return of Matthew Macfadyen’s detective Edmund Reid as well as regular cast members Jerome Flynn and Adam Rothenberg. What do you think? Do you watch Ripper Street? Will you be watching the new season when it starts? More about: Amazon TV shows: canceled or renewed?, Ripper Street, Ripper Street: canceled or renewed? I love this show, it is so good. Awesome cast. Very exciting for someone like me who loves history. Awesome series, I am happy and trilled there will be a 4th season and a 5th to follow. Wonderful characters and stories i am so addicted. Awesome series. I’m trilled there will be a 4th season and happy to hear a 5th season will follow. Very entertaining I love it. Season 4 has begun streaming, is there any idea when BBC America will begin airing for us American fans? 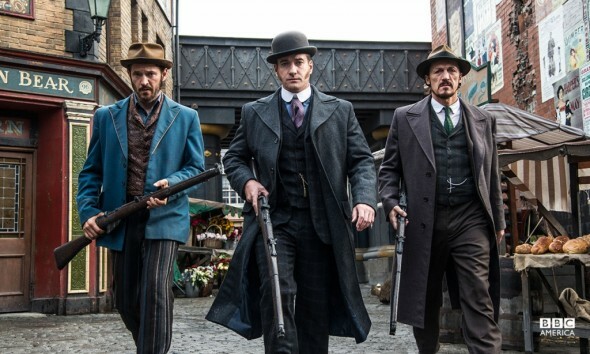 I hope Ripper Street returns to BBC America for Season 4. Love Inspector Reid!